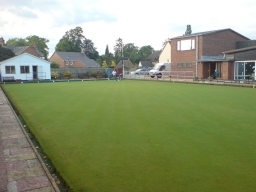 Bridgman Bowling Club was created by the late Bert Bridgman in 1985 when he constructed a 4-rink outdoor bowling green on some vacant land on his Eagle Works factory site. By 1988 this had been extended to incorporate an indoor bowling arena. The project was funded by Bert Bridgman with work supported by members and factory workers. By the time Bert died in 1994 the club had become well-established in the village and beyond. However, when Bridgman Doors went into receivership in 1998, there was a real threat that the bowls club would, with the factory site, be sold off for property development. Members and the local community then sprang into action and with the help of grants and loans from Sport England Lottery Fund, the Harpur Trust and the County Bowling Association raised the sum of £130,000 to purchase the site of the club from the receivers. Harrold and the community of North Bedfordshire had acquired a fine sporting facility and a well equipped social centre. It still proudly bears the name of its founder, Bert Bridgman.